Hell is empty and all the devils are here. Not only is that an important line to remember going into Before the Storm Episode 2 (seriously, just bare it in mind), its an apt synopsis of the overall chapter. Good things don’t often happen to Chloe, but you’ll struggle to tell them apart from the bad in episode two. Following almost immediately on from the last episode, we get to see Chloe and Rachel start to really connect to one another. It initially starts with the Rachel being almost literally held at arm’s length from the player, giving Chloe the chance to be Chloe, you’ll soon find yourself back together. The intensity of the relationship is the foundation of the whole series, but this episode helps define our two leading ladies in relation to each other. This is especially true as Chloe leans on Rachel this time around, needing support from some of the other events happening around them. The fire from the end of episode one is a permanent fixture on the horizon like they are to each other. Related Wccftech’s Best Adventure Games of 2017 – Where Exactly Are We? While nothing in this episode is quite as heart-breaking as the junkyard scene, there are some powerful moments, especially for anyone that connects to Chloe’s desperate, self-destructive nature. In what felt like a bit of a change from episode one, some of biggest decisions Chloe makes aren’t offered to the player. While some things, especially in her chaotic and self-hating life, are outside her control, some of the actions she wilfully makes take the agency from the player. This renders the consequences all the more embittering, for us as the player and Chloe, who can’t overcome her self-destructive tendencies. It’s a powerful way of creating and maintaining her character, even with the player’s interference, and does really help get into her mindset. As for me, I like to try and do what’s best for the characters as play, but I became very aware that was not how Chloe was handling herself right now. Sometimes you have to make the call between two bad ideas, while other times, the decision is made for you. These moments normally let you choose between making it worse or not. What really surprised me about Episode 2 is how different it felt like things could have gone. While we all know with these games that our influence doesn’t change much, episode two made it hard to remember that. The very first conversation went one way before I deliberately sabotaged it. I’m sure something would have organically happened had I not interfered, but it really did feel like I was changing the events laid out before me. It made it much more evoking to feel like you had such control but at the same time, to feel that power getting taken off you. And Deck Nine continue to favor the relationship developing over any strong story overtones. Sure there’s a potential arc forming but for the most part, the characters have their own plans which is lovely as it is tragic. Chloe and Rachel frequently refer to their promise to run away together, which we know never comes to past. Its done well, really well in fact, to the point you start rooting for them before you remember the eventual outcome of all this. There are some hints of magic too, breaking up the thousand tiny heartbreaks that make up Chloe’s life, although nothing as overt as Max’s powers. Like in Episode One we see Chloe dreams about her dad, who seems to offer cryptic advice and new traumas. I already have my own theories about what they might mean, and I’m sure the internet has lots more, but for now, they are nothing but the suggestion of a bigger picture. And once again the soundtrack is stunning. Luckily the game literally lets you take a break to enjoy some of the scenery and a song or two and it’s well worth doing so. The songs are often introspective, calm and sad with something hidden just below the surface. The perfectly mirror Chloe at her most lucid, most vulnerable moments. It’s obvious the soundtrack was commissioned for the game, but Songs from Before the Storm is an album nearly as strong as the game itself. Getting to know the new characters in Before the Storm is nice, but we all know this is a game about Chloe and Rachel. Its story that has no right to be told this well, with episode two bringing them together so sweetly I can’t help but have my heart broken by what hasn’t happened yet. 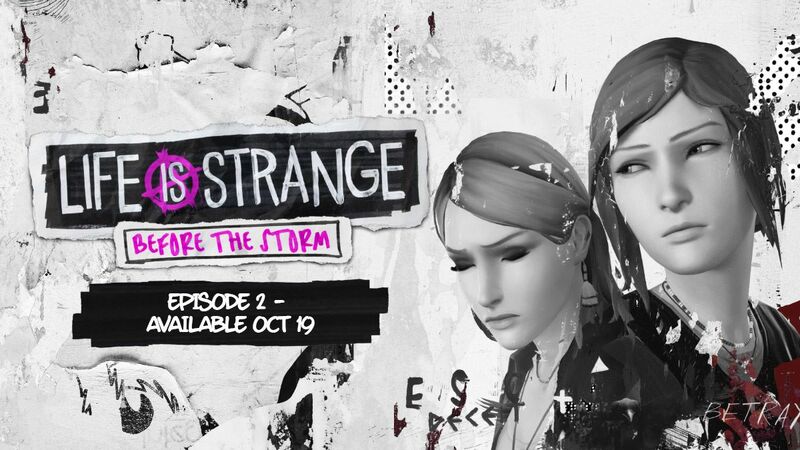 Before the Storm Episode Two is a very strong following to Episode One, and leaving a lot of potential in store for the finale, however hesitant I am about playing it. Although it might not be as strong as Episode One, Episode Two builds in confidence and understands exactly what we want out of this story. Sad, happy, heartwarming and heartbreaking, Episode Two is an emotional experience.